Brookvent won the coveted title of SME of the Year at the recent UTV Business Eye Awards. This accolade joins their other awards that recognise their experience in international markets and success as an SME manufacturer. Brookvent has also set a new industry standard in Heat Recovery Ventilation efficiency. 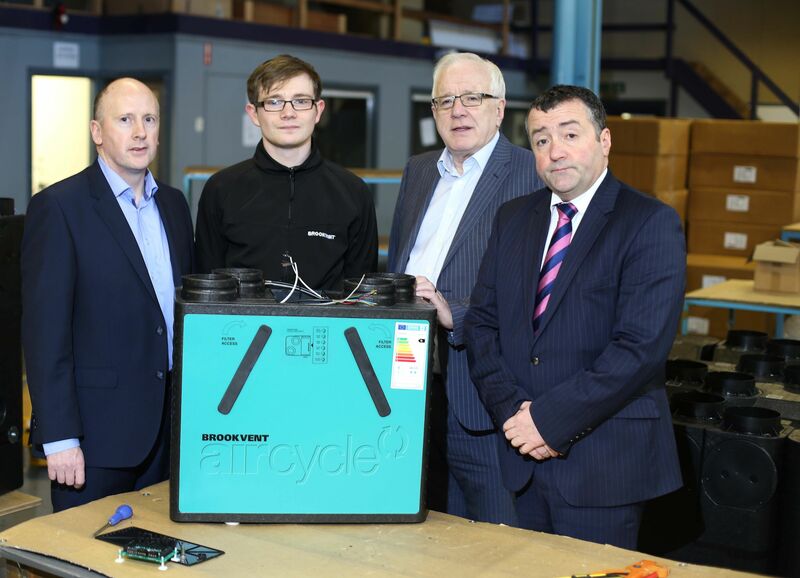 Representatives from the Council recently visited their premises as part of its Made in Lisburn Castlereagh business engagement visits and the Council’s wider investment programme to see first-hand the products they manufacture and sell. Alderman Allan Ewart MBE, Chairman of the Council’s Development Committee, speaking about the visit, said: “This local business has over 30 years’ engineering experience in the design, manufacture and supply of market leading ventilation products for residential properties. Over the years its increased product portfolio has met the needs of their customers across both the public and private sectors. “Brookvent’s strong engineering knowledge has assisted with its growth in foreign markets; and led to the establishment of a base in Poland together with distributorships in Hungary, the Baltics and Russia. Through participation in trade missions to foreign markets Brookvent has achieved its export success. The aim of the business engagement visits are to profile local businesses, as well as provide them with an opportunity to discuss with council officers and elected representatives the key issues that are important to the individual business. The Council has always enjoyed strong links with the business sector and these visits will strengthen this even further. If your business is in the Lisburn & Castlereagh City Council area and would like to take part in a business engagement visit contact the Council’s Business Solutions team on Tel: 028 9244 7389.